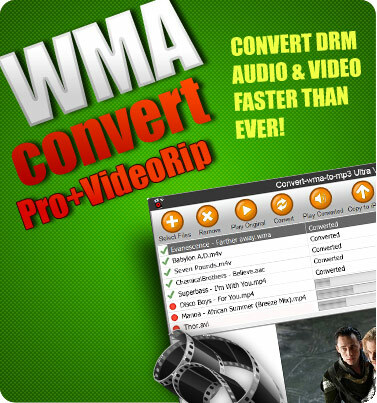 WMAConvert is the best software to convert audio files. The program was created to convert WMA to MP3 and other audio formats. You can remove DRM protection and convert WMA music and audio books to MP3 without quality loss. You will be able to transfer and play music on mobile phone, PC and on any popular audio players like iPod, iPhone 4S , Google Android devices , Samsung Galaxy , Nokia phones, Microsoft Zune, Creative Zen, Sandisk, Blackberry playbook, any other digital MP3 player and video game consoles. Songs converted from WMA to MP3 will be copied directly to your mobile device. If you buy WMAConvert Professional or Pro+VideoRip editions you will get free bonuses: Free YouTube Ripper, audio CD Ripper and CD Burner. Besides wma to mp3 conversion, the program allows you making conversions between various audio formats, as it supports conversion from any audio format to MP3, M4A, WMA, WAV. If the majority of your songs and albums are in Windows Media Player format and you want to transfer them to iPod, but you can't just drag them to iTunes library, WMAConvert is an easy and right solution for that problem. 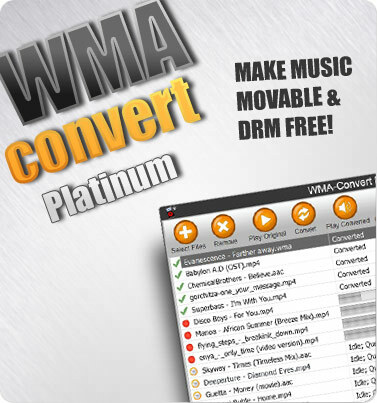 If the wma files are DRM protected and you still want to play them you should use WMAConvert and convert wma files to more widely-supported mp3 format. Also, you can play unprotected wma music files on any other MP3 players and gadgets. WMAConvert is available in three editions and every of them will make a wma to mp3 conversion in seconds. Moreover, you will be able to convert wma files to mp3 in batch mode to save more time. The tool is easy-to-use and was developed with the most user-friendly and well-designed interface. 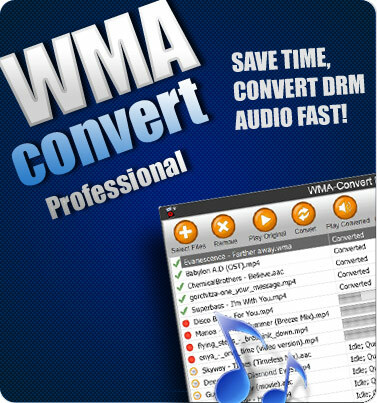 This powerful wma to mp3 converter makes conversion in few clicks, everything you need to do, is to select an output and input format. To start wma to mp3 conversion select desired audio format, then follow an instruction of the program and click “Convert”, after those easy manipulations audio conversion process will start automatically. You will enjoy the speed of the audio conversion and high quality of converted files. If you are iPod, iPad or iPhone user you have faced the problem after downloading DRM protected WMA for sure, because Apple software does not support protected Windows Media Audio files. The easiest and the best decision is to download and install WMAConvert, which allows you to convert wma to mp3 and all protected audio files to the most common and compatible MP3 format.